1 Hour 1 Min. 6 Sec. Duration: 1 Hour 1 Min. 6 Sec. Tesu, also known as Palash and Flame of the Forest (Butea monosperma), is an India’s native tree that makes a wonderful yellowish-orange dye. It flowers in march and petals look like lively flames. Legend says that Lord Sri Krishna used to play Holi with Tesu flowers. The flowers are soaked overnight in water and boiled to obtain a fragrant yellowish-orange coloured water. 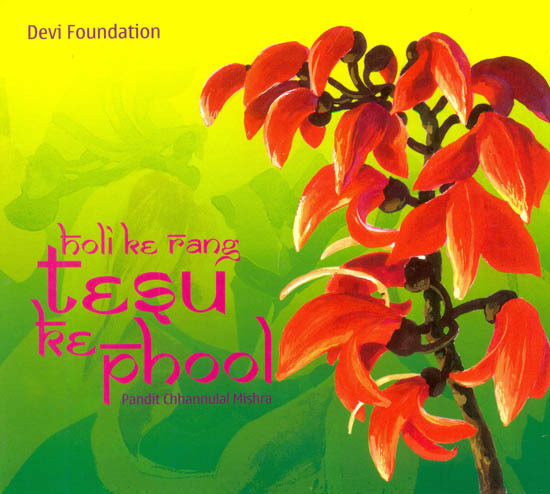 Devi Foundation is a registered not-for-profit organization based in New Delhi. With this musical album as its sixth venture, it is helping under privileged women and children in India. The Foundation’s efforts are directed to help them achieve their goals in education and physical well being. The Foundation actively uses different forms of music, art and theatre in communication, particularly in rural areas, in combination with a regular programme of medical camps and educational workshops for women and children. All the proceeds from the sale of this album will go towards such activities. For further information. Pandit Chhannulal Mishra is a leading vocalist of the Benaras gayaki and of the Kirana gharana. He is a recipient of various honours and awards which include the Uttar Pradesh Sangeet Natak Akademi, Naushad and the Bihar Sangeet Shiromani awards. He is widely recognized for his authentic and lyrical rendering of Khayal, thumri, bhajan, dadra, kajri and chaiti. His recordings for Devi Foundation include (cassette and CD) ‘Anjali-a complete offering to the Goddess’ ‘Sunderkand’ (four volumes) and ‘Shiv Vivah’ from Sriramcharitmanas, ‘Kabir’ (two volumes) and ‘Krishna-Madhava’ (two volumes).